The holidays are busy. It is irrefutable. There is just a lot going on. You are supposed to be able to stay on top of getting gifts for everyone, even making thoughtful homemade treats to share. It is a lot to keep track of. Santa isn’t the only one who needs a list that needs checking twice during the holidays. I think I have half a dozen lists! 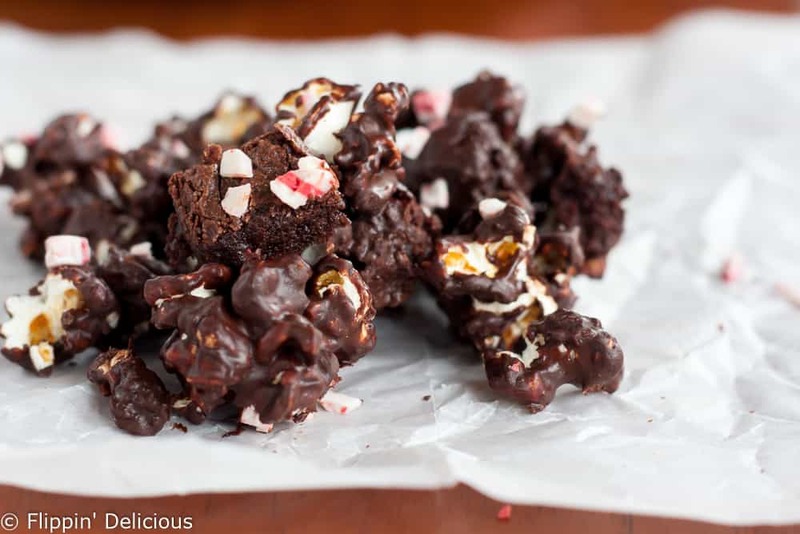 That is one reason why I love this gluten free peppermint brownie popcorn recipe. Just a few simple ingredients, and a few minutes. It is perfect for gifting! 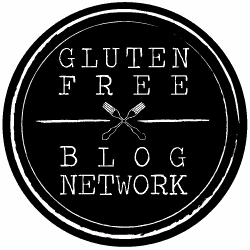 I had heard from some of my gluten-free blogging buddies that Big Lots often has some great gluten-free products. I hadn’t checked it out yet, but have been wanting to for a long time. 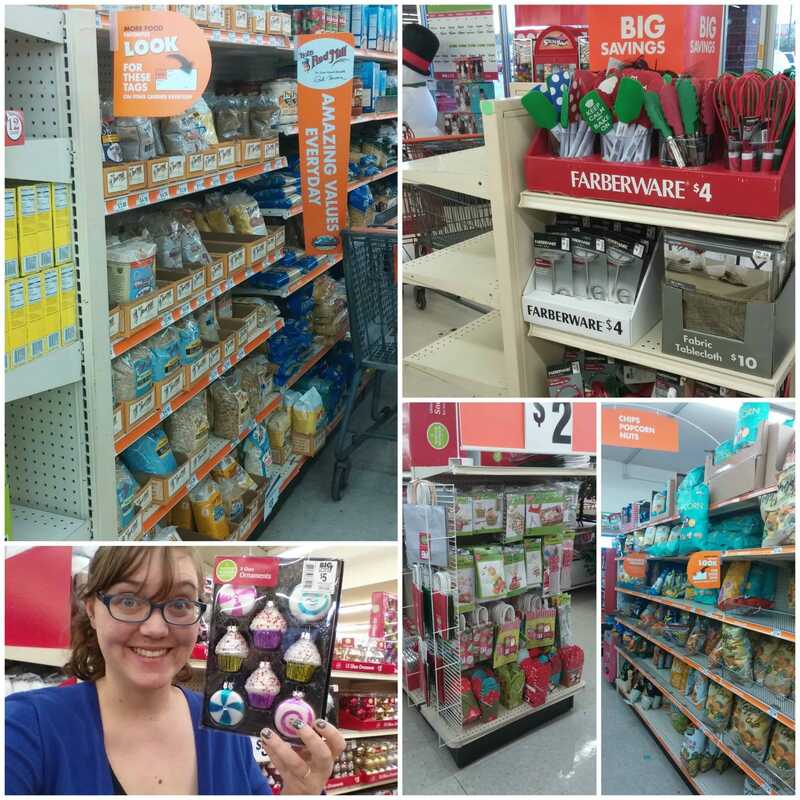 I was pleasantly surprised that I really could get everything I needed at Big Lots, and for a good price too. My Big Lots even had a Bob’s Red Mill section full of gluten-free mixes. 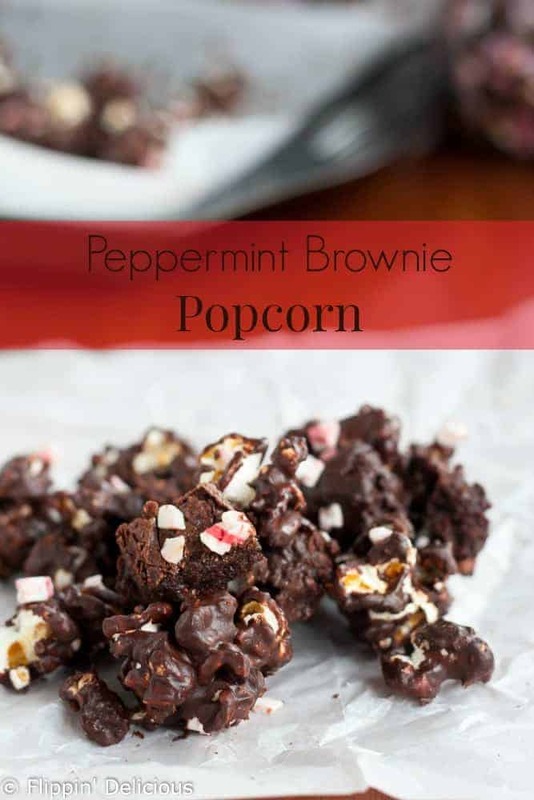 I grabbed a gluten-free brownie mix to use for this peppermint brownie popcorn recipe, and a gluten-free cornbread mix to use for Thanksgiving. They really had a pretty extensive food section full of quality ingredients at great prices. 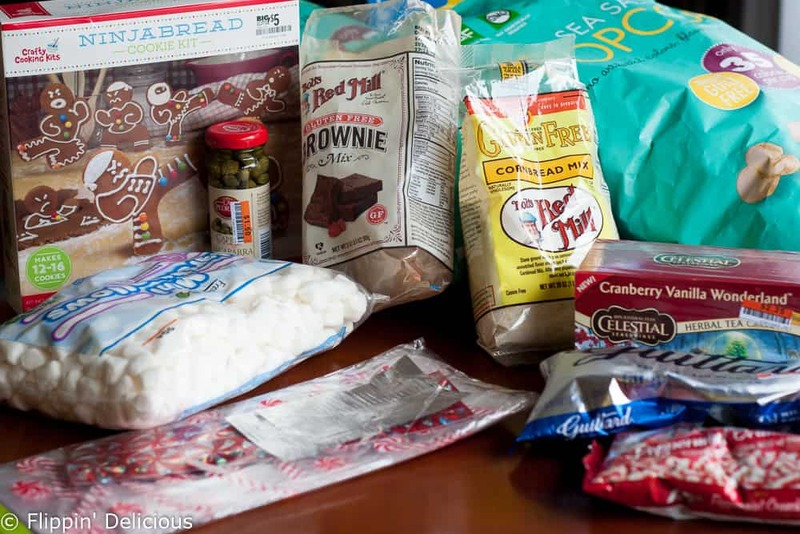 I was able to get all of the ingredients to make my gluten free peppermint brownie popcorn, plus the cute peppermint and candy cane packaging to go with it. Also, awesome baking items (I found a ninja-bread-man cookie set!) and this cute little santa spatula that I used. I was also able to get the last few Christmas presents I needed for my girls (a Doc McStuffins stethescope for Miss E and a shape sorting toy for Baby T), plus the wrapping paper from two family favorites: Star Wars and My Little Pony! I’m in geek heaven from my wrapping paper finds. And I even found cupcake ornaments. CUPCAKE ORNAMENTS! I couldn’t pass those up. Of course, styles and assortment vary by store. But that just means you might find even cooler stuff at your store. For me, Big Lots was a one stop, get everything I need, shop. Leaving me a little more time to tackle the rest of my holiday to-do lists! Cut cooled brownies into small pieces and set aside. Fill a large mixing bowl with the popcorn. Add 2 cups of brownie chunks on top. Melt 1¾ cups of chocolate chips in a microwave safe bowl, heating in 30 second increments until just barely melted. Once melted stir in the remaining ¼ cup of chips and the coconut oil until smooth. 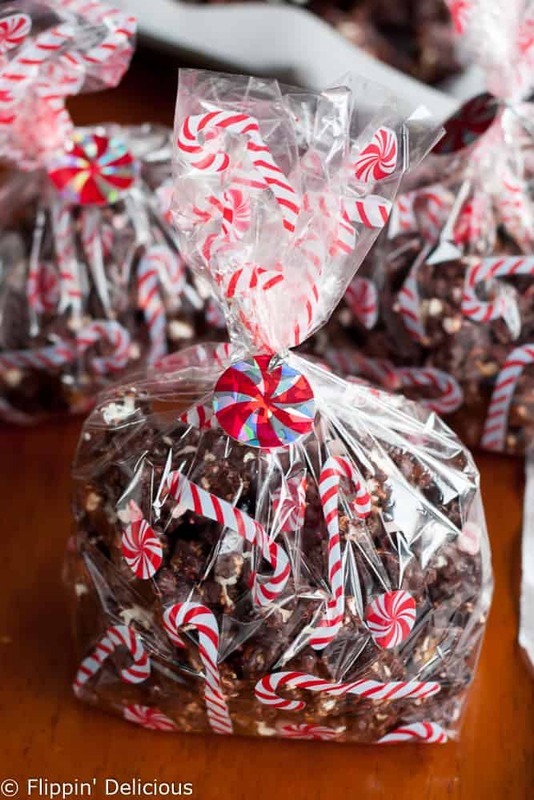 Pour the chocolate over the popcorn, add 1/ cup of peppermint bits, stir to coat evenly. 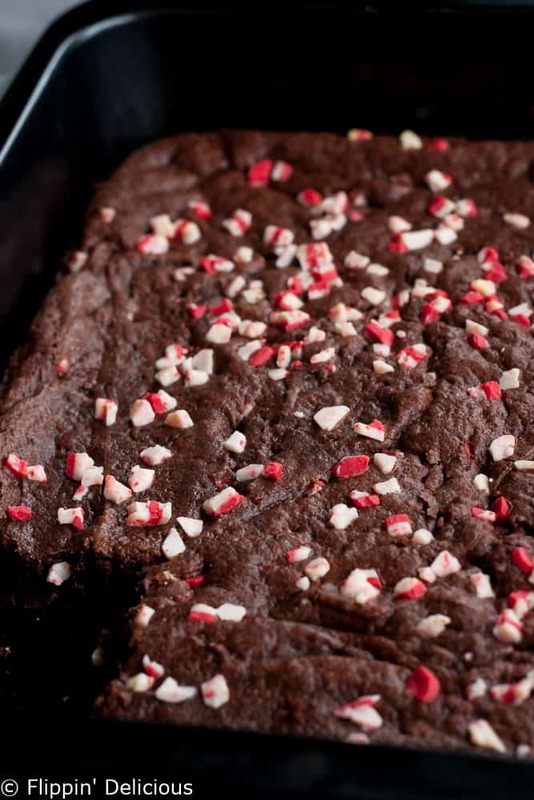 Immediately spread on a prepared baking sheet and sprinkle with the remaining peppermint bits. Cool, and then break into pieces. The coconut oil helps the chocolate to set up firm and shiny. It also helps it to be thin enough to coat the popcorn without clumping together. Use refined coconut oil for less of a coconut taste. You can omit the coconut oil if you'd like. I just found it made the chocolate easier to work with. For more holiday inspiration follow Big Lots on Facebook, Twitter, Pinterest and/or Instagram. What are you going to create this holiday? This is so much fun!!! I love how you used the bownie mix!! Such a cute idea to give away for the holidays!! Thanks Emily! I love easy gifts like this. What a fun recipe!! This would make great neighbor gifts. 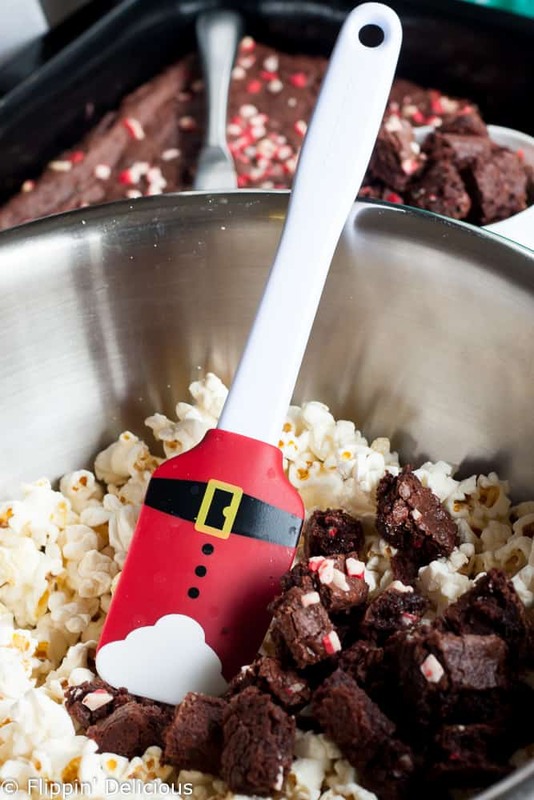 What a cute idea — seems like popcorn is in the air — seeing so many delicious recipes. I love the idea of combining it with brownies. I’ve also had a major obsession with those ninjabread cutters from last year since I saw someone make a recipe with them — they are probably my favorite cookie cutter ever (although I love my grumpy ones a lot too). Thanks Audrey! I have been coveting the ninjabread cutters for more than a year. So excited to use them! Wow what a fun treat! Yum! Pinning. Thanks Emily! It is perfect for Holiday gifting. OMG DELICIOUS! 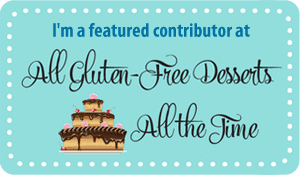 My son and husband have Celiac Disease and I know they’d destroy some of this mix! Thanks Summer! I had a hard time keeping it away from my girls. This looks sooooo delicious. And amazing holiday gift idea! Thanks Steph! Homemade gifts are my favorite.